At the site were a few other folks from the Astronomical Society of Victoria and their friends. It was also great to be joined by a few others on Ice In Space who had seen my post when they were looking for last minute options, which added to the group atmosphere. Skies were beautiful and clear through the night, aside from a tiny amount of low cloud around midnight, so we had been fairly relaxed about the weather but as morning twilight progressed, thin high cloud became visible across most of the sky and particularly in the east. The benefit of that was some beautiful changing sky colours through twilight. 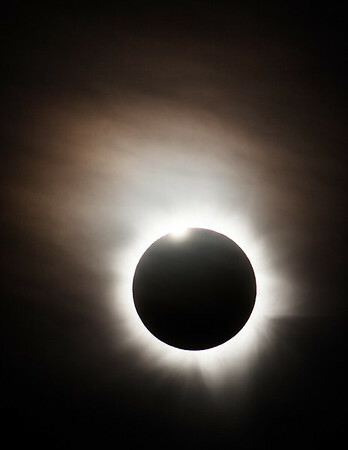 The visual view of the eclipse was spellbinding and beautiful, but the cloud affected corona imaging a great deal. However, I hardly needed to touch the cameras during totality and was able to concentrate on the visual experience. However two minutes is a desperately short period of time to try and take in so much. Right around 2nd and 3rd contact the light seemed to flicker slowly (a bit like aperture flicker in a timelapse), which I presume is the effect of Bailey's Beads popping in and out. I also noticed the effect of shadow bands rippling fast on the ground in front of me. Particularly after the eclipse I noticed this till quite a long time afterwards (more than a minute after totality ended). Having an eclipse low in the sky also benefited from the 'moon illusion' with the corona seeming larger than I remember from 11 years ago with an eclipse high in a clear blue sky. In binoculars there were some beautiful prominences, and I was surprised by how much their visibility changed during the two minutes. You can get some idea of that from the video below. An award of some sort goes to the driver zooming along the Mulligan Highway (away from the sun) as though nothing unusual was happening, despite being less than two minutes from second contact with the light already very weird and fading fast. Who does that?? Were they going to turn their lights on to keep driving through totality!!? 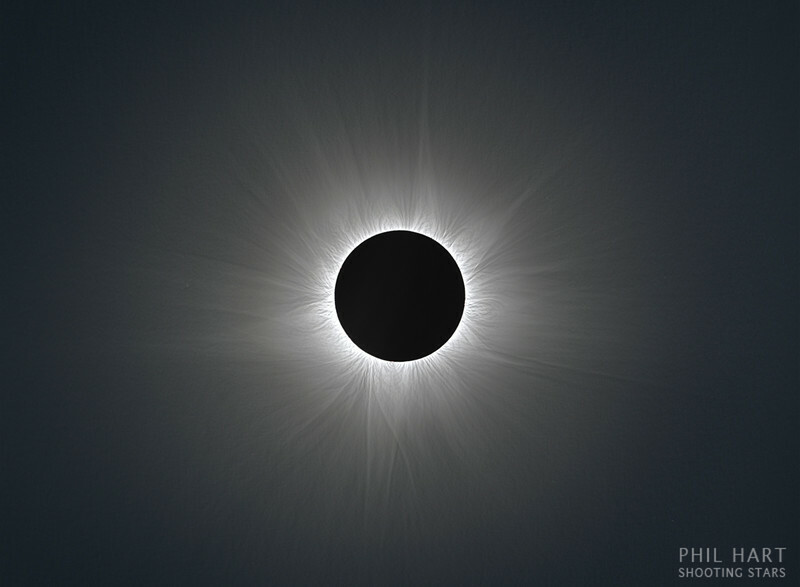 One of my imaging goals for the eclipse was to create an image of the solar corona, using images taken at a wide range of exposures to capture the full brightness range from near the edge of the Moon to the fainter outer reaches of the corona. This goal was compromised by the high cloud over the sun during eclipse time, so I am surprised at how much detail it has been possible to pull out of the resulting images (see image at top). I had planned a routine using Eclipse Orchestrator running on two laptops to control two cameras, which I had been practising for several weeks at home before shipping all the gear up to the eclipse. 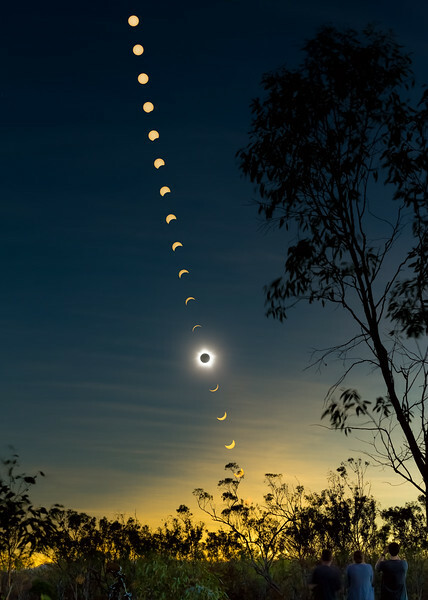 One of many things I had determined in that testing was that the cameras needed to be in continuous shooting mode for them to reliably trigger successfully through the tightly packed 2 minute sequence around totality. In single shot mode, sometimes the cameras would miss a signal from the computer and then with mirror lock enabled they would get out-of-sync and the camera controls could not be updated between exposures. After having setup, polar aligned and got everything connected in the dark during the night before the eclipse, I then gave each script a full run through after midnight to verify that everything was working smoothly. And indeed all seemed good. I then tried without much success to grab a couple of hours sleep out in the open, but the adrenalin made that quite difficult! 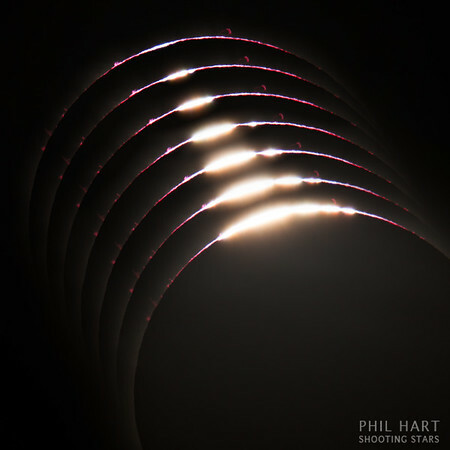 In an early morning 'pre-eclipse' and 'lack of sleep' daze, I thought it strange that the cameras were in continuous shooting mode when they were receiving individual exposure signals from the computer, so I made an ill-thought-out decision to change them to single shot. What was I thinking - you should never change anything after a successful test run!! I know from my testing at home that this could have been disastrous, but in the end I was lucky that the sequence through the mid-range focal length worked as intended up until 3rd contact. So with that stroke of luck going my way, the solar corona image at the top is a composite of images taken with a William Optics Zenithstar II (545mm, f6.4) and Canon 5D MarkII camera (ISO100), with exposures from 1/90th sec to 2 seconds long. For the outer parts, I have also used images captured with a Pentax 300mm f4 ED IF lens (1/4 and 1 sec, ISO100) and another Canon 5D MarkII. 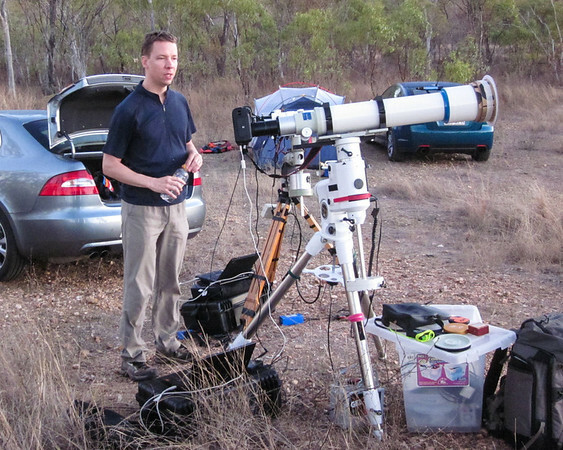 I also had a Takahashi FS-102 with 1.6x extender (giving 1300mm, f13) with a third Canon 5D MarkII tracking on EQ6 mount. I didn't end up with a high-res coronal image sequence with this scope as intended because of the change to the camera settings. However, the end result may have been even better than I intended. 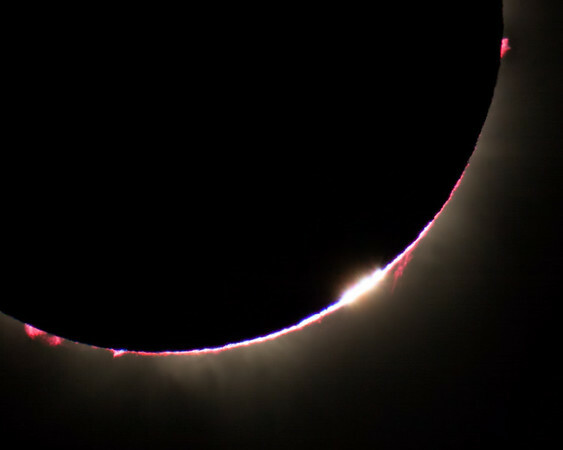 The camera took a fairly fast sequence right the way through totality and 2nd and 3rd contact locked on the same short exposure setting used at second contact, which allowed me to render this video below from those frames. It's not what I intended but I quite like the result! Here are close-ups of the image sequences at second and third contact which were used to make the video above. 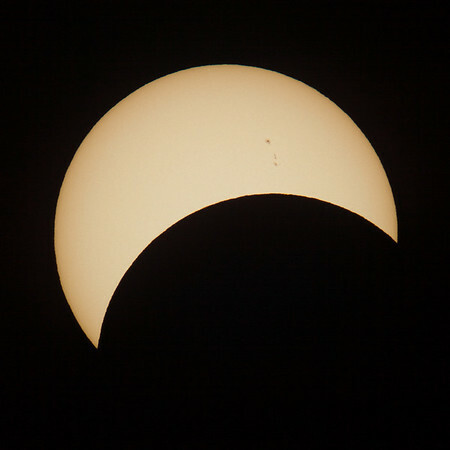 Alas, the nature of a solar eclipse is that it is over so quick! The Diamond Ring shining through the cloud marked the end of totality. With the sun higher in the sky after totality, the seeing (steadiness of the air) improved and I was able to capture some reasonable detail in the sunspots as the partial phases progressed. Given the highly uncertain nature of eclipse chasing, it was a great morning! 1) Takahashi FS-102 with 1.6x extender (giving 1300mm, f13) with Canon 5D MarkII tracking on EQ6 mount. 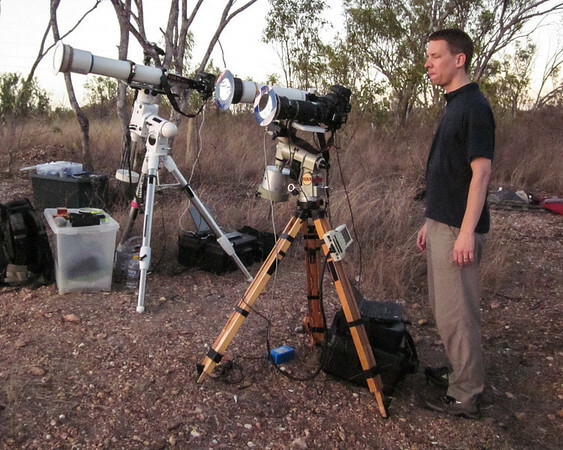 2) William Optics Zenithstar II (545mm, f6.4) with Canon 5D MarkII tracking on my trusty old Vixen GP-DX. 3) Pentax 300mm f4 ED IF lens and Canon 5D MarkII also on the Vixen GP-DX. 4) Canon 1100D (aka Rebel T3) with Samyang 35mm lens on a tripod. Thanks to Dan Chubb, Gavan Salter and Chi for the loan of their gear that made all this possible! Astronomy Picture of the Day - 15th November 2012: What a buzz! 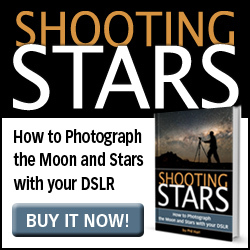 Congratulations on your APOD appearance, and thanks so much for the photos and descriptions. 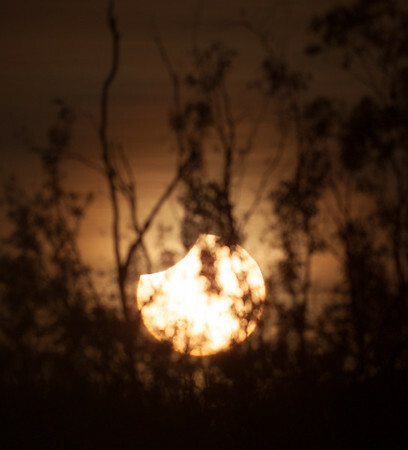 My son and I made a last minute decision to drive from Brisbane and view the Eclipse from the same location - well worth the effort. 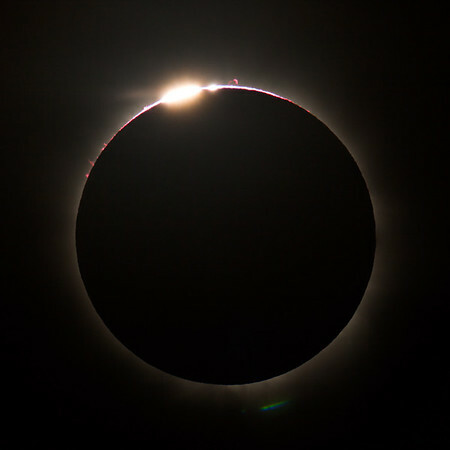 We also observed the disinterested driver heading south during one of the planets most spectacular events. Great pics and narrative (might be in a wheelchair for the next one!!! ). great decision Denis.. no regrets chasing eclipses. can't believe the number of people who saw others driving around during totality! Yep, I can't believe the geniuses driving around oblivious. But almost as bad were the ones in Townsville who went to a lot of trouble to get best position on Castle Hill to view a spectacular 96% partial eclipse! Given a bit of motivation, they could have WALKED to totality from there! I was watching and photographing it from Palm Cove. We were really lucky as clouds cleared just about 1 minute before the totality and covered the sky again after 2 minutes after the totality. But during 3 minutes we had absolutely amazing view. thanks Ilya.. you did indeed get very lucky at Palm Cove but sounds like the crowd atmosphere there was amazing! Thanks for the newsletter and the heads up about the meteor shower. Im heading out to whale beach tomorrow night after work to do a little night shooting and will see if I can last the distance for the shower. Work unfortunantly gets in the way of my hobby at this time of year, Im in wine sales. However its been too long between photos so I thought Id get out and see what I can do through Sydneys light pollution. Whale beach is quite far north and I have been told when shooting over the ocean the sky glow is greatly reduced. Wish me luck would love to jag a meteor in there. Good luck Matt. Shooting over the ocean is a great option. 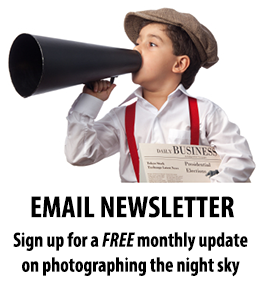 Reply to the newsletter with your images or post them on the Facebook page!